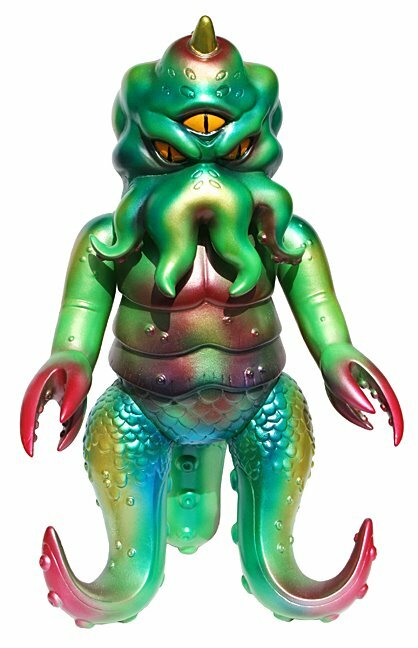 My latest Max Toy Company toy offer is this group of custom painted Tripasu. For those not up to speed, Tripasu is a joint creation by myself and Cronic of Japan. I supplied Cronic a sketch of my upcoming kaiju called TriPus, and he re-imagined the character in the fighting form that is popular today with the young kaiju collectors out there. While I’m not one of those collectors I do like what he came up with. Anyways with my short attention span for painting the same thing x50 pieces, I took about 15 of them and made a unique paint to each, blind bagged them ( meaning there each in a foil bag that you can see thru ) and have offered them up for sale. These were fun to do and about 3 are left via the Max Toy web store. The one that looks dark with gold is an interesting thing I tried, I gold leafed the figure with 24k gold leaf ! I suppose in these days something that will go up in value (ha-ha)…OH and the name, folks are confused, well me too, but the name has to do with Cronic, as the “asu” part is added to his creations as a nod to his wife…so TriPasu was the resulting name.